Download the first three albums from The Secret Place. 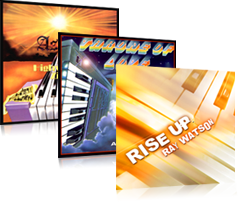 The albums Rise Up, Throne Of Love and Highways To Zion feature praise and worship music from the early years. Experience The Early Years collection - classics!! Purchase the CD Set with a 35% discount and have it shipped to your address. If you are using MasterCard you must choose the PayPal option when purchasing. (You do not need an account with PayPal). In step 5 of the checkout process you are asked to select "Payment Method." Choose PayPal. Once you have chosen PayPal you will be given the option of making payment with your MasterCard. Download all three albums with a 30% discount. Downloads are made available immediately upon purchase. Purchase The Early Years as individual albums. Coupon discounts still apply to individual albums.